Also over the last many months the strategy has been to be very stock specific , conserve cash and capital as well as be patient. Although as much as we try to look into the long term positives technicals are still not pointing a turnaround but only giving good entry and exit points. The trend remains down but we need to watch for any turnaround signals till then focus would only be on extreme short term trades or value picks. Above all there is no point being brave in a falling market and rather be meek and slowly buy. With equities Panic has no Logic so stocks can go to highly depressed valuations and stay there in a risky period. But this is the best time to research stocks !!! So readers can mail me their views on specific stocks here nooreshtech@analyseindia.com or comment on the blog. -> Down channel continues till we dont get out of it there can be no bullish or turnaround hopes but the swings in the channel are good 10-15% so one can time entry and exit. 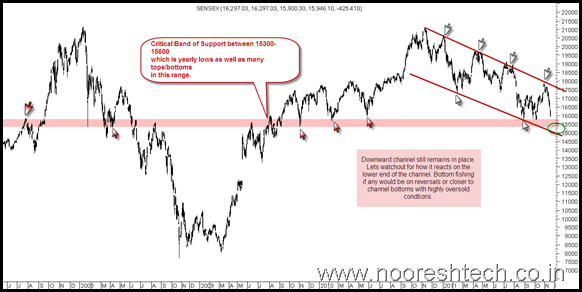 -> 15300-15600 is a major important support level over the last 2-3 years. -> 14500 is the 50% retracement. -> RSI has just hit 30 but still is not heavily oversold but closer to 4500-4600 we may get into that zone. -> Dollex 30 and Defty ( Sensex/Nifty in dollar terms have hit new yearly lows ) and now close to 14500 and 4400-4500 equivalents. - > We would now wait for reaction to 4700 ad 4500 levels. 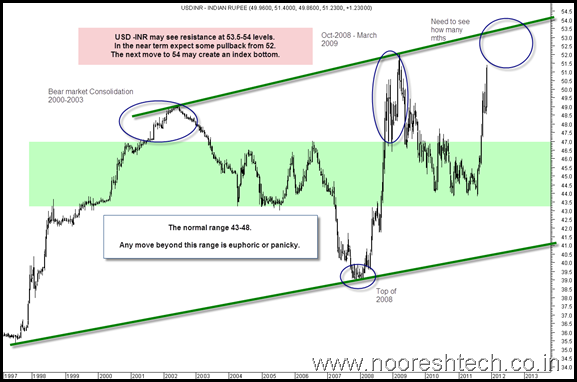 USD – INR is up big time and is showing we may get into a similar time zone like October 2008 to March 2009 consolidation on equities. 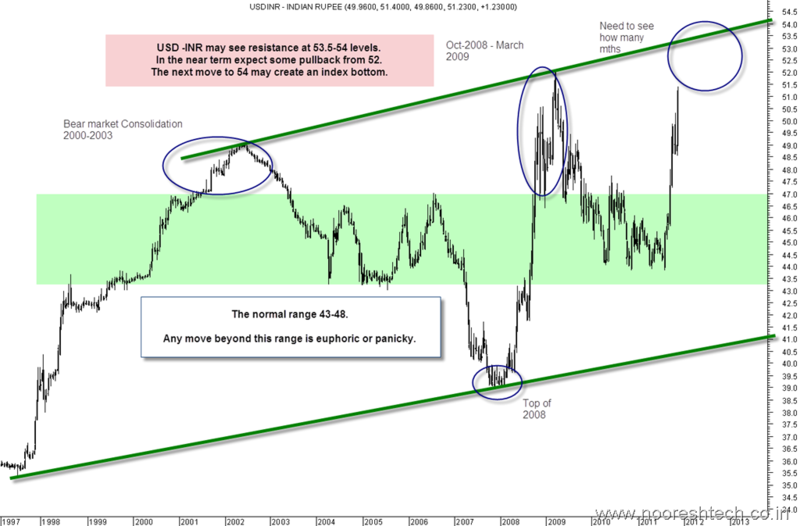 We will wait for further reaction above 52.5. 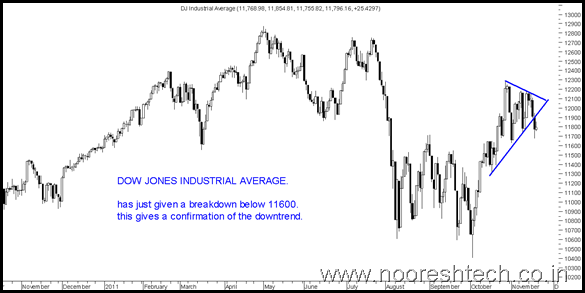 Dow Jones has just given a breakdown. 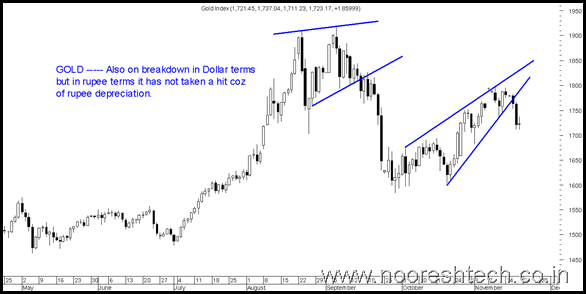 Gold has given a breakdown in comex but because of Rupee depreciation it has not taken a hit in MCX. Continue with stock specific long term buying but it has to be high quality stocks and dont buy just because the stock has fallen 30-50% in short time. Many of the stocks i like have been discussed recently in previous posts. Some stocks under review ( NOT A BUY CALL need more inputs ) – India Glycols, Coal India , Piramal Healthcare ( have been waiting for 300 levels for quite long ) , Escorts, Suprajit Engineering, DIC India, Clariant chemicals, Anil Limited. Thanks for the timely update. 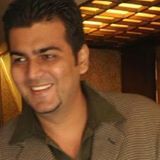 Whats your take on TIL & TRF. Both supposed to be good companies but have taken a heavy beating.